285 million people in this world are visually impaired. Yet, 80% of that number wouldn’t be if only they had access to something as basic as a pair of prescription glasses, or a routine fifteen-minute cataract removal operation. In fact, over 12 million children with visual impairment simply need glasses. World Sight Day aims to raise awareness of this global issue and influence governments to fund blindness prevention programmes, enabling those with needless impairments to receive treatment. Founded by the International Agency for the Prevention of Blindness, their objective is for a world in which no one is needlessly blind. Of the many events happening around the globe in recognition of World Sight Day on 10th October, one of the most interesting – and fun - is TOMS’s. Founded in 2006 by entrepreneur Blake Mycoskie, TOMS provides the basic needs of footwear and sight to those in developing countries, and areas of the US. Every pair of shoes sold provides a new pair for a child without, protecting them from injury and disease. In 2011, Mycoskie realised this model again through TOMS eyewear. There are thirteen countries TOMS and their Sight Giving Partner, Sera Foundation, works with, including Ethiopia, Cambodia and Guatemala. Not only do TOMS help someone see, through a simple operation or prescription glasses, they also support community-based eye programs, create medical jobs and provide basic eye care training to health volunteers and teachers. Since 2011, 150,000 people have had their sight restored through purchases of TOMS eyewear, Blake and TOMS tell the story in an educaction video here. 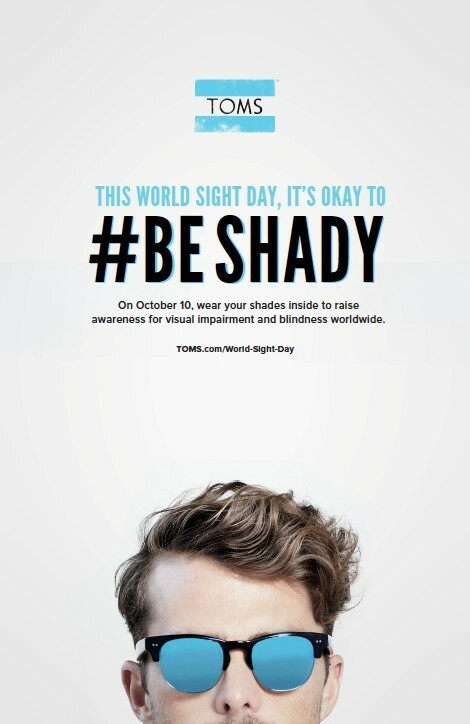 For World Sight Day, TOMS are asking us to #BESHADY, and wear a pair of sunglasses indoors to raise awareness of global blindness and the 285 million people globally who suffer without treatment. Upload a picture onto Instagram and Twitter of you in your shades, with the hashtag #BESHADY, to join the global campaign - watch the video here. Dazed are giving away TOMS sunglasses to #BESHADY selfies inspired by great movie moments - think Tony Montana in Scarface. Upload your movie selfie of you in your shades indoors to @dazedmagazine @TOMS with #BESHADY #TOMSPUBQUIZ by 10th October World Sight Day for your chance to win. 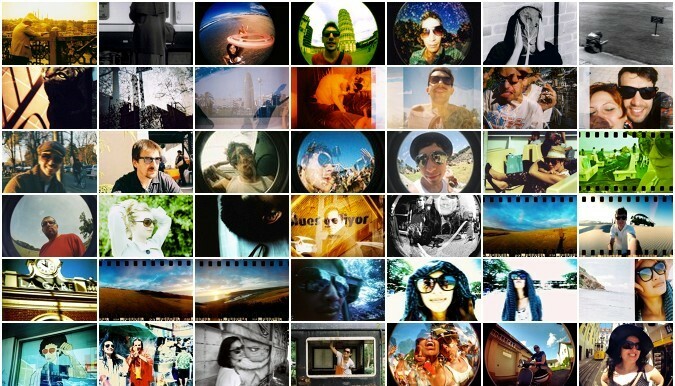 For inspiration head to our dA-Zed guide to selfies. TOMS limited edition World Sight Day sunglasses are available now.